From the dark sounds of grunge to the corniest of dance-pop musicals, never let it said that you don’t get variety on these pages. The Greatest Showman has become something of a phenomenon. A contemporary musical loosely based on the life of celebrated American showman P.T. Barnum (and, by all accounts, taking a slightly revisionist view of his character), the film opened to something of a critical mauling at the end of last year, but has seen its star slowly rise through word-of-mouth to become the most unlikely movie success of the year. Even now, 9 months after it’s release, it is still showing at cinemas around the country, with new life being breathed into it by hugely popular sing-a-long events. Let’s be clear. This film is not subtle and is somewhat formulaic. But it is also hugely entertaining, a constant barrel of energy and exuberance, driven by a star performance from Hugh Jackman, and a supporting cast that includes Zac Efron and Michelle Williams. And a power-packed set of original songs that carry the film through to its inevitable, feel good conclusion. The soundtrack is the work of Benj Pasek and Justin Paul, who were also responsible for the Oscar-winning City Of Stars, from the slightly less feelgood La La Land. And so to the songsheets. For Come Alive, this – like a number of the songs from the film – really needs a strong rhythmic backing to work. I’m not going to try and suggest a strumming pattern for this, but you could do worse than listen to the rhythms in the song and try and ape that. Plenty of muted strums will add to the effect – some of those are indicated in the songsheet with the [X] chord. The song also has a number of places where it breaks into acapella / clapped interludes, that again you could do worse than try and emulate. Probably best sung with a group of singers. As for This Is Me, this is becoming something of a modern classic. The gentle start, and breakdown at the beginning of the last chorus, are worth emulating to give the song some texture. Note that some of the lyrics overlaps, particularly with the oh-oh-oh-oh’s, and along with plenty of opportunities for backing vocals and harmonies, this is probably best tried with a group of singers. 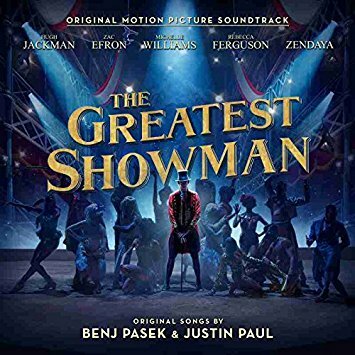 Categories: Musical, Pop, ukulele chords | Tags: 2010s, 2018, Musical, Pop, The Greatest Showman, ukulele | Permalink. I must admit that by the early 90s my interest in popular and alternative music had somewhat dissipated. This probably had something to do with the advent of a family of my own, as well as the rise to dominance of the rave scene (which I just never connected with), but by that time my musical interests were headed off in a more rootsy, country, folky direction (Bruce Cockburn, Van Morrison, Nanci Griffth and others), and as a result I really lost touch with what was happening in mainstream music. So whilst Nirvana were definitely on my radar (it would be hard for them not to be, so ubiquitous were they at the time), they weren’t somebody that I really paid that much attention to. And I’m not going to stand here and say that I had a subsequent life-changing revelation and realised everything that I’d missed. But without you even trying certain songs just ooze into your consciousness, and become part of the background of your life. Come As You Are is one such song. 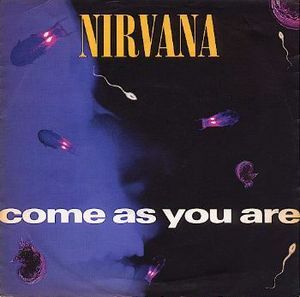 Released as the second single from the bands huge, iconic album Nevermind, Come As You Are was a more obviously commercial song than the surprise initial hit from the album, Smells Like Teen Spirit. Whilst still obviously retaining the sounds and template of grunge, this was clearly a song that would build on that success and establish Nirvana as more than just a one-hit wonder. That it did, but that success was – to a certain extent – part of what ultimately resulted in Kurt Cobain’s tragic end. And so to the songsheet. There are other versions of this out there, not much different from this. This is the same key as the original recording (but not the MTV Unplugged version), and I’ve tabbed both the main riff (which plays throughout the song) and the solo. Enjoy! Categories: Rock, ukulele chords | Tags: 1990s, 1992, Nirvana, Rock, ukulele | Permalink.